Football season starts up again at the University of Oregon on September 2nd and fans and students are getting ready to descend on Autzen Stadium. For some students, this may be their first real experience with college football, and let me tell you, it's going to be a good one. Going to a Ducks football game is a rite of passage for UO students and here are 13 things you need to know. This is a lie, but we say it at the beginning of every game anyways. Even if you haven’t spent a lot of time in Oregon, you are probably aware of it’s rainy, gray reputation. Come prepared for rain and, equally importantly, be prepared to dry off your seat from the pregame rain. Not only will the parking be crowded and absurdly expensive, you will miss out on the sacred walk to Autzen. There’s something special about walking the mile long path to Autzen with thousand of excited fans. Somehow, everyone walks in sync and if you pause for a moment on the bridge, it feels like the bridge is bouncing from the weight of the synchronized foot steps. If you walk the path to Autzen, you will also get the best photo op with the stadium. No Oregon football game would be complete without the dramatic entrance of the football team, led by our mascot riding a motorcycle on to the field. Even though our mascot isn't the most traditionally intimidating, he's definitely the coolest. One of the unspoken rules of Oregon football is that you must learn the fight song or at least clap along. Every time the Ducks score, our Oregon Marching Band plays the fight song and everyone sings along. If you don't know the fight song, it's usually printed on the back of the tees from orientation or the SAA Beat Tees (we'll get back to those later). This is one of my favorite parts of the football games. At the end of the third quarter, everyone joins in on singing and dancing to "Shout” by Otis Day and The Knights to pay tribute to the toga party in 1978 movie Animal House filmed on the UO campus. In 2015, Nike made a new video for “Shout” that featured Oregon Alumni, including Marcus Mariota, Ty Burrell, and Kenny Wheaton, and the Duck. All I can say is I'm glad the Duck wasn't playing Wonderwall. For whatever reason, there’s a lot of singing at Oregon football games. “Coming Home” by Eugene born and raised Mat Kearney is played at every game and honestly I tear up a little bit when I’m singing along because I love Oregon so much. Sometimes Phil Knight, the co-founder of Nike, makes an appearance at football games. The University of Oregon is jokingly referred to as the University of Nike by students and fans because of Phil Knight's numerous charitable donations to his alma mater to aid academics and athletics. 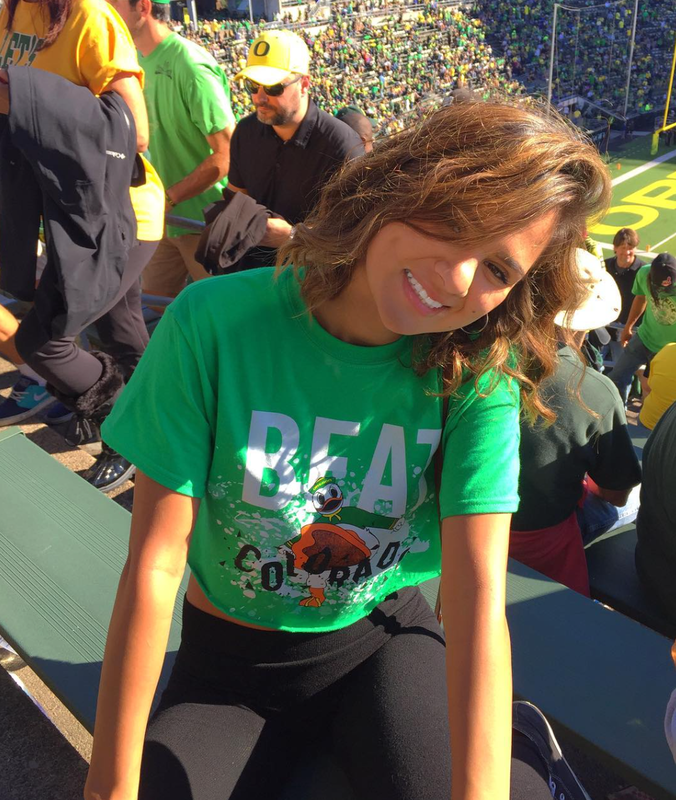 The UO Student Alumni Association (SAA) has exclusive t shirts for SAA members for each football home game called Beat Tees. Some students customize their Beat Tees by cutting them up or adding embellishments. SAA members can pick up their Beat Tees at the Duck Store on the Friday before the home game. If you want to snag a shirt early, head to a t shirt folding party! You can pick up your shirt early, make new friends, and most importantly, get from free food. When the football schedule is released, the Athletics Department also lets fans know what colors to wear to the games. If you don’t remember to check, you’re generally safe wearing anything Oregon, green, or yellow. The University of Oregon has one of the most intense student sections in college football and its name is the Pit Crew. They keep the crowd and team hyped up. If you are a student trying to get tickets, look up the schedule and get online early. Student tickets are distributed on "first come, first served" basis based on class standing, giving upperclassmen priority. Have the ticket page ready to go before your designated time and avoid residence hall wifi if possible, since everyone online at the same time tends to slow things down. It’s no secret that I’m not a sports fan. I can vaguely explain what a touchdown is, but that’s about it. Even if you don’t love sports, go to at least one game; it’s an experience unlike any other. 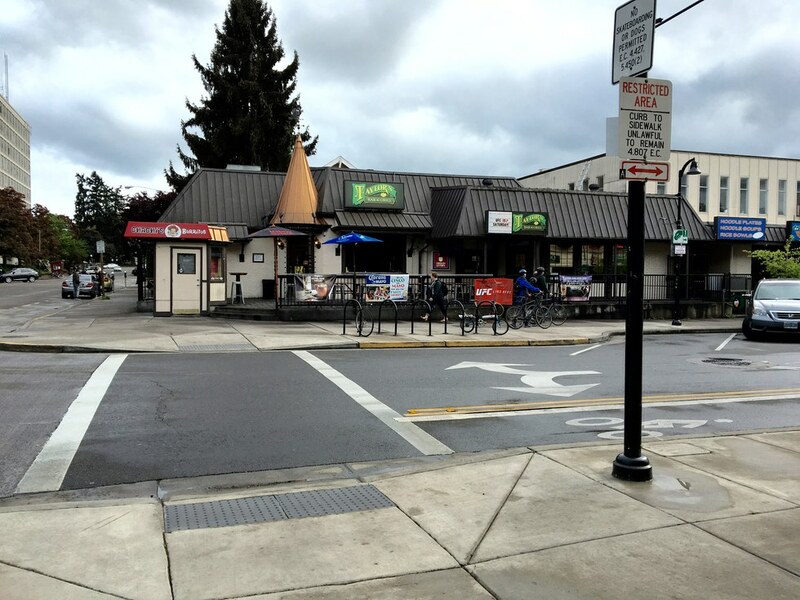 If you can't get tickets to the game or are looking for a place to pregame, check out Taylor's Bar & Grill on E 13th Ave. It's packed on game days and always a good time.